as an aid to orientation, the Imperial Palace Grounds. Note the elegant incorporation into the whole map of the yin-yang design, important in oriental philosophy. For a blog or a general website, you should create an infographic that is not more than 600 pixels, and the length should not exceed 1800 pixels. Visually allows you to post infographics of 1240 x 1750 pixels. Pinterest allows you to use a size of 600 x infinite pixels. On Pinterest, you can make it as long as you want to! Facebook allows you to post an infographic with a minimum size of 403 x 403 pixels, and a maximum of up to 2048 pixels by 2048 pixels. Google Plus allows you to offer an infographic at a size of 497 x 373 pixels, up to 2048 x 2048 pixels. In general, you should create infographics that you want to be viewable by tablet owners by 600-640 pixels. People spend more time on their mobile gadgets these days than their desktop computers and this number is only expected to rise over time. For the next few years, the growth of mobile phone users over the next few years is expected to greatly increase exponentially. So, your infographics must always be mobile-friendly. Smartphones, in general, have a 4-inch or larger display area. So you should work to ensure that your infographic does not exceed 288 pixels in width. Choice: Posters for Tomorrow, the International Poster Bienniel, or Typomania. Posters submitted for the Museum Show must be of highest quality. If you can not afford the print – at the very least you must tile laser print. 40 winning posters and assign a special mention plus a prize of 2,500 Euro to the author of the work that will interpret the values of Shaping the Future at its best. All the selected posters will be part of a catalogue and will be part also of an exhibition in Florence in May 2018. Posterheroes: Shaping the Future is an international communication and social graphic art contest organized by PLUG – non profit Cultural Association, Favini S.r.l. and IED Firenze. An animated simplified overview of the very basics. I recommend setting the speed to 1.25 if her voice is too slow for you. I especially enjoy the Beethoven poster puzzle and cameo with Steve Jobs. Please click on the glossary of common type terminology. Along with the FAQs, it may answer many font-related questions. The DVD is available in the library for viewing. click here for a sample from the book. 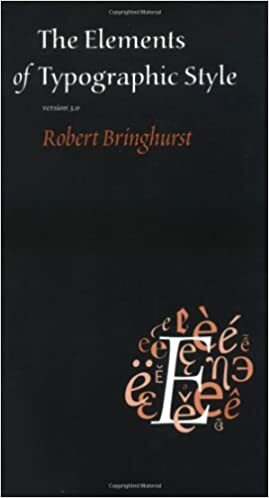 Author Robert Bringhurst writes about designing with the correct typeface; striving for rhythm, proportion, and harmony; choosing and combining type; designing pages; using section heads, subheads, footnotes, and tables; applying kerning and other type adjustments to improve legibility; and adding special characters, including punctuation and diacritical marks. The Elements of Typographic Style teaches the history of and the artistic and practical perspectives on a variety of type families that are available in Europe and America today. The last section of the book classifies and displays many type families, offers a glossary of typography terms, and lists type designers and type foundries. The book briefly mentions digital typography, but otherwise ignores it, focusing instead on general typography and page- and type-design issues. Its examples include text in a variety of languages–including English, Russian, German, and Greek–which is particularly helpful if your work has a multinational focus. –This text refers to an out of print or unavailable edition of this title.